Mumbai, April 7 (CRICKETNMORE) - Defending champions Mumbai Indians and and two-time winners Chennai Super Kings, the most successful teams of the Indian Premier League (IPL), will begin the 11th edition of the Twenty20 cricket tournament with a mouthwatering clash at the Wankhede Stadium today. 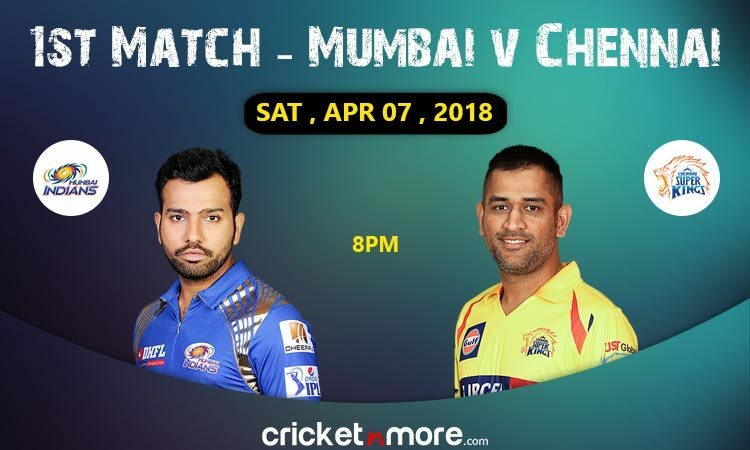 Hosts Mumbai, who have laid their hands on the coveted crown thrice (2013, 2015, 2017) will be led by India opener Rohit Sharma who is the most successful captain in the cash-rich T20 league having led Mumbai to a treble of titles. CSK have a formidable track record in the IPL and have notched up the most number of appearances in the final. Apart from winning the title twice, they have finished runners-up on four occasions.